I am really quite thankful that we have welded-wire fence on the east and the south boundaries of our property. The trash from nearby streets is at least kept off of the property because of this fence barrier. However, the west and half of the northern fence lines are barbed wire, which I’m not too fond of. Crossing to the pecan orchard side, or hiking on to the river, entails either crawling under the sharp, barbed wire, or trying to hike a leg over the top wire of the fence. For my efforts, I have a number of rips in the crotch of my jeans and more than a few hole-riddled t-shirts to prove my own ineptness at going over, or under, the fence. If the difficulty of the barbed wire were not enough, part of the north side of the property fence line is a combination of welded-wire fence, wood privacy fence and cyclone fence. Most of this fencing belongs to our neighbor, Steve. Other fencing on the ten-acre ranch, is the usual, necessary chicken-wire to protect the chickens from predators. 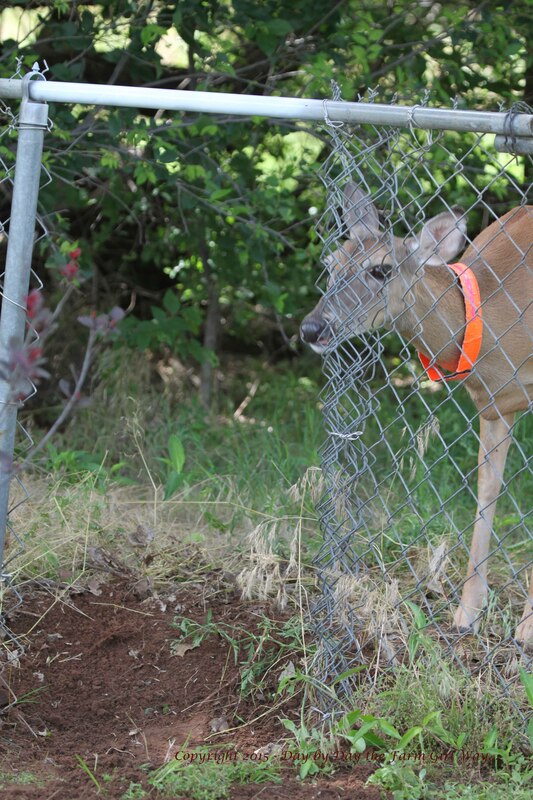 Also, we built the deer pen of solid welded-wire dog kennel panels for the same reason – to keep Daisy deer safe from predators while we were raising her. 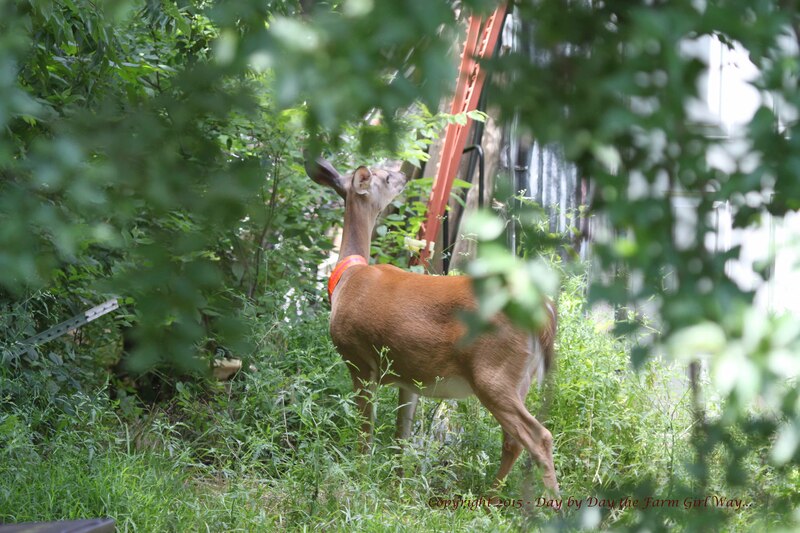 And, after we turned Daisy loose to become the wild deer she was meant to be, it became evident that, if we wanted to harvest any vegetables for ourselves, it would be necessary to put fencing around our garden and FD’s mother’s garden. Early in Daisy’s life as a free-roaming deer, we had not given much thought to one sweet, deer becoming many, hungry deer. 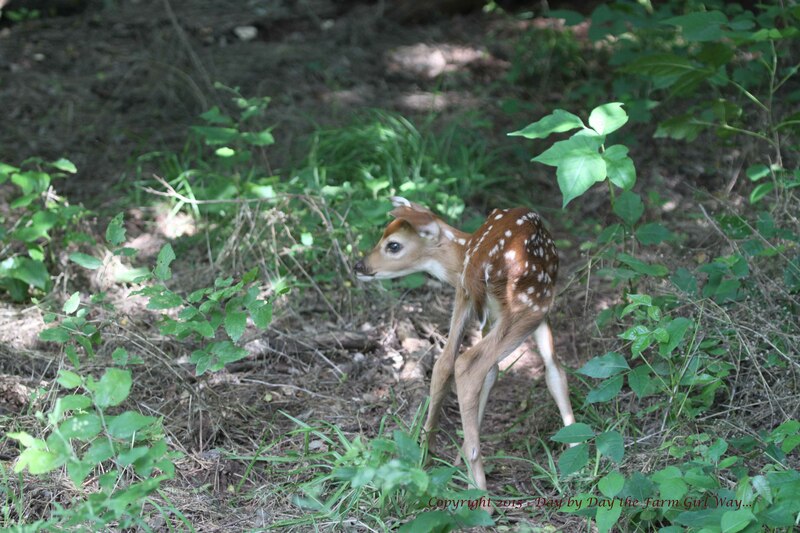 Fawn Heidi in June 2014. Daisy jumped the fence to the other side but Heidi could not figure out how to follow. For more than twenty minutes she ran back and forth, panting and crying out. But it has bothered me a lot over the years we have lived here, that many tragedies result from fencing. Last year, FD found parts of a rabbit lodged in the chain-link fence between us and our neighbor Steve. It appeared the rabbit was trying to escape a predator but could not get its midsection through the fence. And, each summer I find numerous turtles stuck in the woven wire fences. Most are lucky to be rescued when I drive the buggy along the fences to pick up trash and check for any trouble with the fencing. Just last week, because I had missed patrolling the property lines for a couple of days, I found a land turtle who had gotten stuck going forward in the fencing, but the wire section was not wide enough for his shell, and he perished in the sun. There are places along the fence line where critters can get under, but of course they do not know that. And oddly, the turtle could have easily backed out – he was not lodged in the fencing. But I’m sure his only thought was getting through the fence. 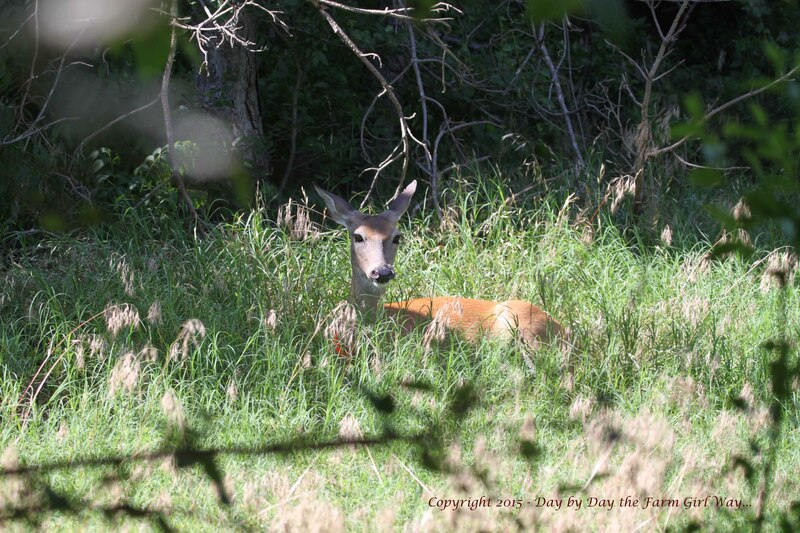 Many times, when Daisy deer comes to visit, she is sporting long gashes down her back from ducking under barbed wire fencing. The wounds heal quickly, but I hate that this happens. On my hikes to the river, I see animal hair on the bottom line of barbed wire fencing where animals cross from one field to the next. While I have never seen it happen, I have seen photographs of birds and small mammals caught or tangled in fencing. I have also seen photographs of deer attempting to leap over fencing, but catching their hind legs between the top two strands of wire, and dying from not being able to free themselves. I guess what I dislike most about fences, is the problems they cause my Daisy deer. For the past three years, Daisy has had her babies across the chain-link fence in our neighbor Steve’s back yard. And, each year, we observe first hand, that Daisy does not seem to understand the concept of fences. She leaps over without a problem, but seems to think her little fawns should just follow. When they do not immediately join her, she grunts for and waits and grunts again, and soon the panic begins. 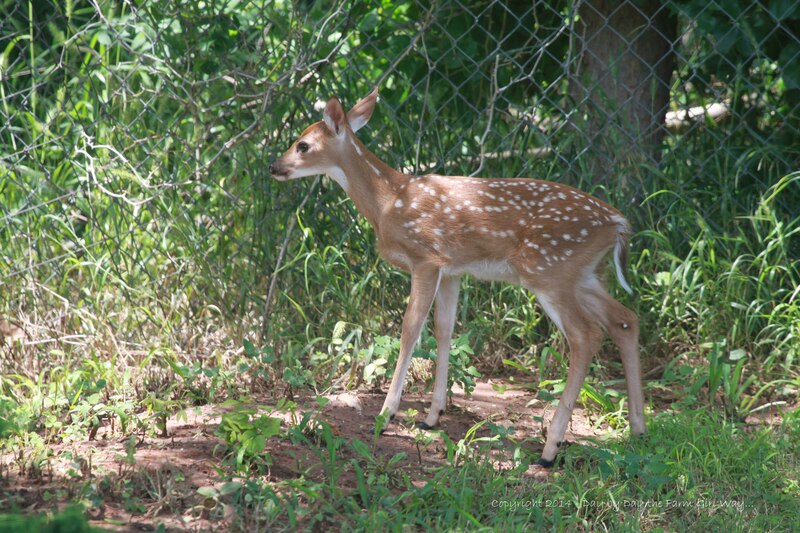 The fawns cry out, running back and forth along the fence line, distraught at not being able to follow their mother. Daisy continues to grunt and looks at them as if she does not understand the problem. Finally she will leap back over to join them. Eventually, the little family ends up taking a very long way around Steve’s property, venturing quite a bit north to the pecan orchard and then taking a long hike back to our place. 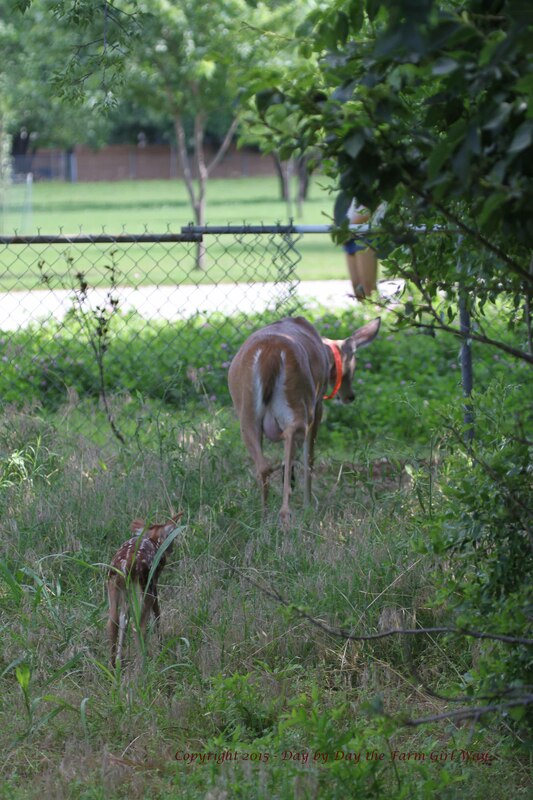 Two years ago, Steve gave us permission to open the fence near the pecan orchard, just below our slope to allow Daisy and her fawns easier access to our property. But it still seemed to be difficult for the little ones to figure out where the opening was, since it was located in the wooded area of the canyon, far below Steve’s immediate backyard and our front yard. Daisy checks out FD’s tools and takes a lick and nibble just to be sure. FD and Steve agreed to paint the top rail of the fence white so that deer could easily see it. Daisy gives her approval “sniff”. Daisy checks out the new opening. Daisy makes her way to the other side of the fence! This year, shortly after Daisy gave birth last month, Steve mentioned that he thought we should open the fence up top, between our two properties – his backyard and our front yard. 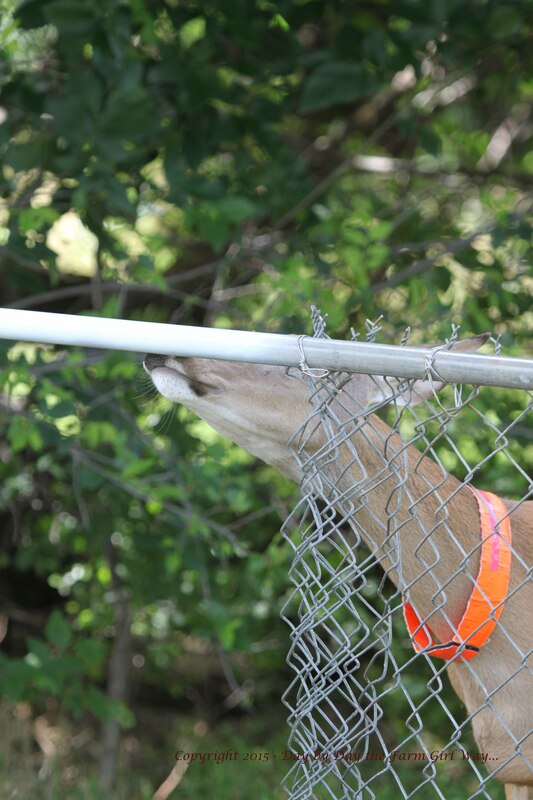 FD thought it could easily be done in a fashion that would not destroy the fence, and yet offer Daisy and her fawns easy access between the two yards without having to venture into the woods or the canyon, where it was more likely that predators might lurk. FD got busy that very next day and opened the fence. While we wait to watch Daisy bring a fawn through the new opening, Daisy decides to rest a bit. 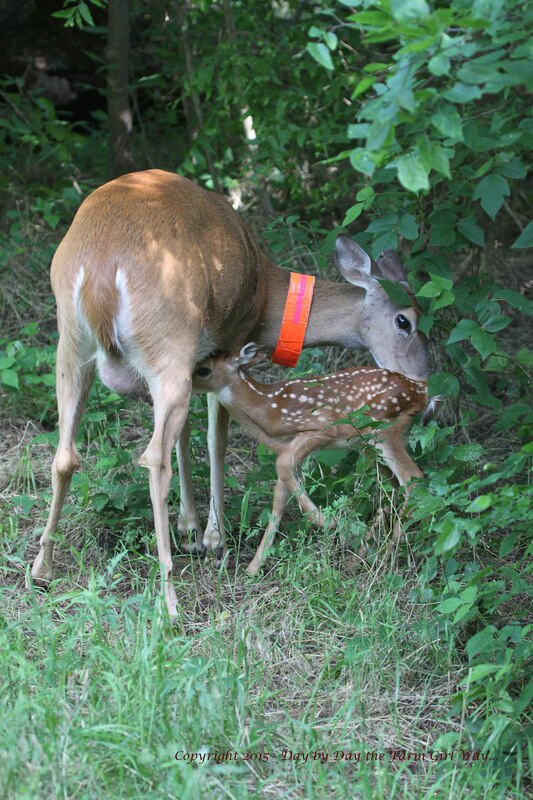 After about twenty minutes, Daisy decides to call her fawn for nursing time. 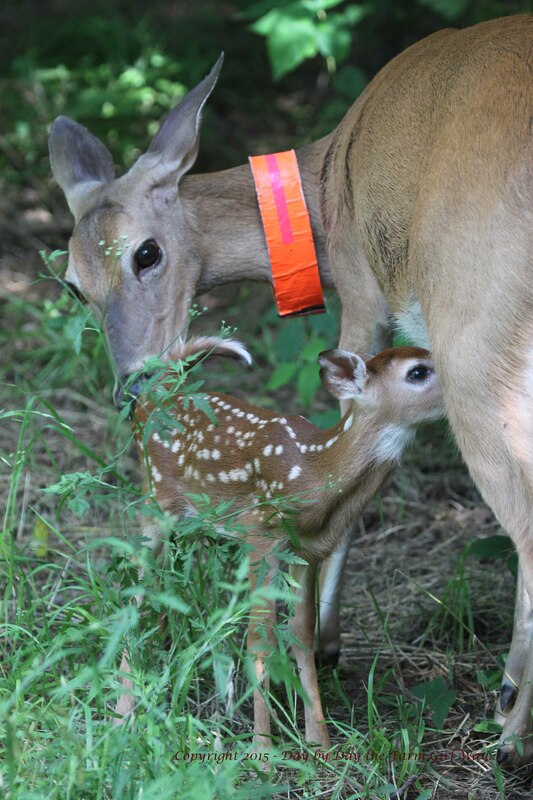 After nursing, the fawn does a little romping and wandering. It is time to find the next hiding spot to rest. 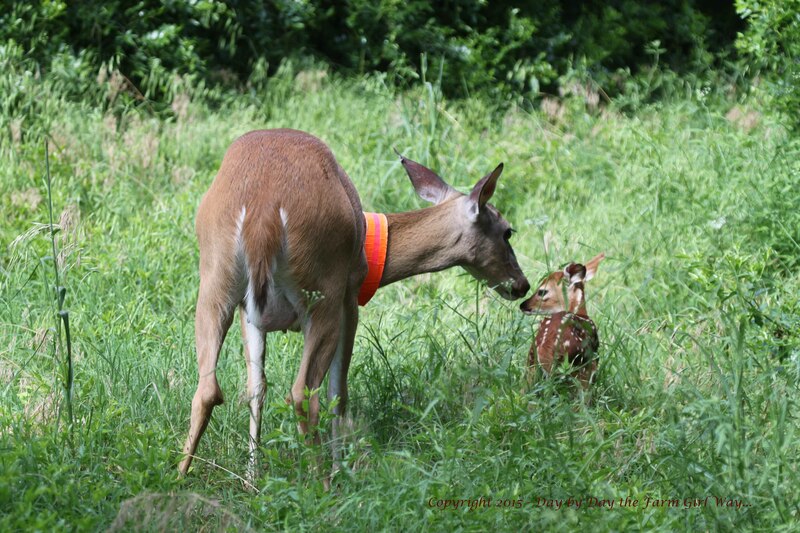 Daisy constantly stops to groom and bond with her doe fawn. Daisy carefully proceeds to the opening in the fence. A little nonchalant grooming before setting out again. Mama leads the way through the new opening. 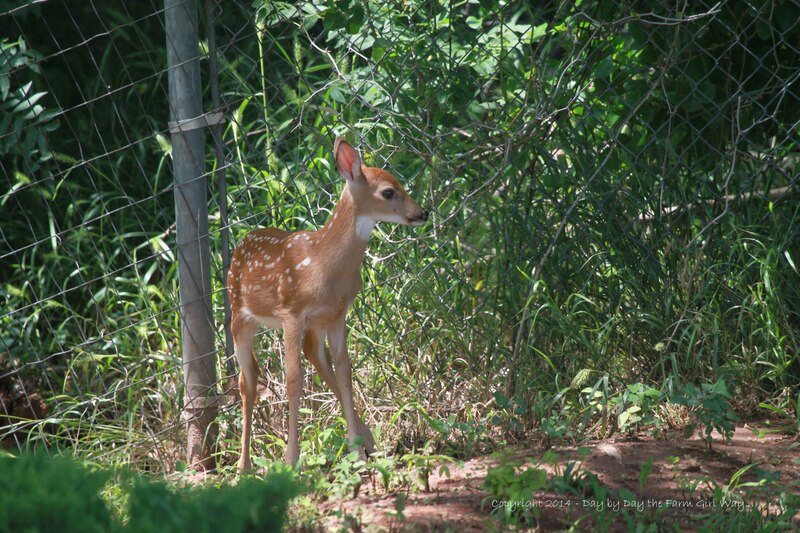 The fawns are two weeks old now, and Daisy has utilized the new opening in the fence several times. Daisy has been very secretive this year about where she hides her little ones. Always sure to hide them separately, I never know whether she has her babies over here or in Steve’s backyard, unless I spend a lot of time observing her. And, not surprisingly, I have noticed the foxes, one turtle, and an armadillo using the opening as well. It did not take long for the neighborhood critters to realize the magic door. And I must admit, even a large mammal like myself enjoys the ease of passing under the new, secret opening! I am happy not to have the worry about hooking my pants on those chain-link barbs anymore! Once again an informative and timely blog. 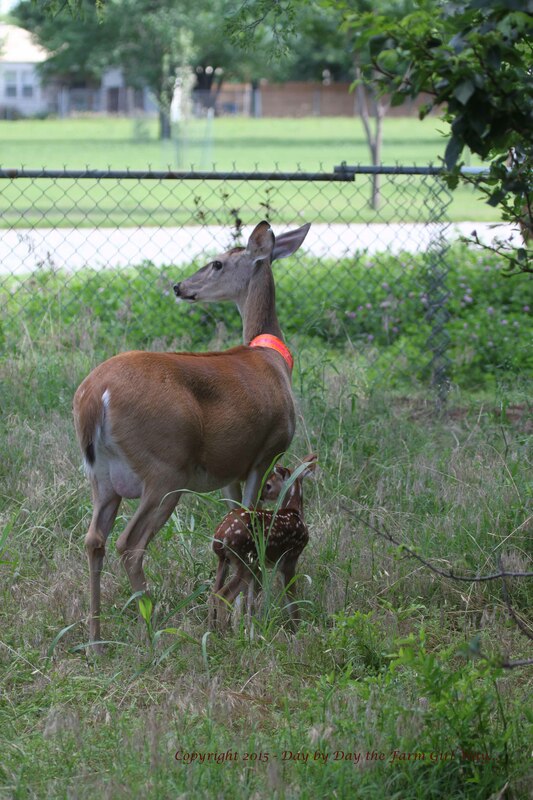 Nice to see photos of Daisy and the fawns. You always have a way of giving me a break in the busy schedule of rehabbing. Thanks again for the journey. Thank you, Yetta. I imagine you have a lot going on since the spring time brings many babies. We were fortunate only to have the two latest squirrels. I met with our new game warden today, in order to renew my license to rehab wildlife. I am hoping for a slack year raising orphans. I can’t keep up with these elderly dogs, the gardens, fruit trees, mowing and all that I do in the house. Oh, but I do love being busy. It’s lovely to have purpose, isn’t it? Thank you, Sid. I know, I felt just horrible about the turtle, especially since I generally do such a good job to patrol the fences. I always check them before mowing too. I really hate to come up on anything that perishes here. FD and I always try to investigate to see what happened, and make sure if it is something we can correct that we do so. I just love how you’ve struck a balance between protecting the critters and yet allowing them to be wild. Very nice of you to open the fences like that! I have to say though, until the last paragraph I was holding my breath because you had only mentioned one fawn. I’m so worried that something will happen to those babies. No names yet? The suspense is killing me, lol. Hello Kim! 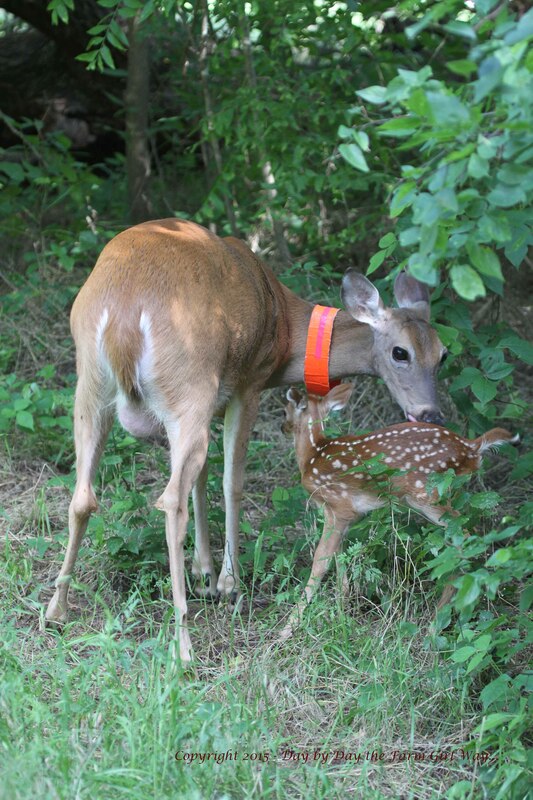 I worry too, but Daisy has been extra secretive this year and at any given time I have only seen her with one fawn. Most of the time she’s kept them at our neighbor, Steve’s backyard. I usually know the areas where she has them – separately – as she patrols and watches from a distance. She will bring them together any time now after the first month. So far we have not seen them enough to observe the differences so that we can name them. 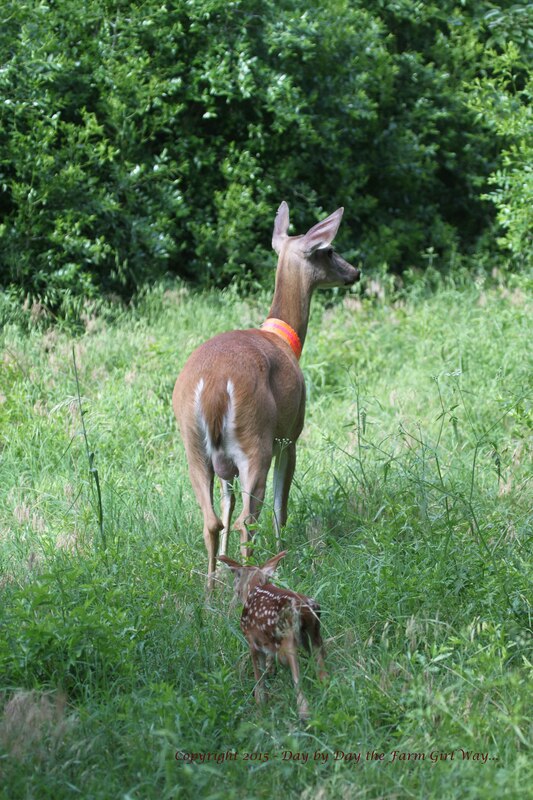 One fawn appeared to be larger than the other early on, so we’ll see if that has changed. One was such a tiny girl. So glad you were able to work things out with your neighbor to open up the fence. That sounds like the perfect solution. It’s interesting that you should be writing about fences. Last evening my Aunt Rae and Uncle Bob stopped for supper on their way from Arkansas to Minneapolis. She gifted me with a barbed wire wreath crafted from an old barb wire fence on the farm where I grew up. My father had given her the wire many years ago and now she is down-sizing. Not sure where I will hang the wreath. But I know now that I won’t lean it on the ground as I was contemplating. How wonderful to have a memento from the old farm! I wish I had been more “artsy” about items like that from our family farm.What a great idea though, with the barbed wire wreath. I also laughed a little… I too, have an Uncle Bob. Are you getting some of that volatile weather up north? Be safe!! Henrietta, I had a BIG smile as I read your comment. You have me PEGGED! Ha ha! I have been busy in my “weed patch”. After so much rain the weeds took over before I could get in the garden much. Even the flower beds around the house are requiring a lot of work. Daisy has been VERY secretive this year about nursing and hiding her babies. I assume all is well as she hasn’t been frantically looking for a missing baby. I have seen them but not sure if it is the same one each time as I’m observing from quite a distance. I’m hoping to get some photographs together where I have photos of both girls, and then we’ll announce the names! It’s so exciting! 🙂 Oh, and by all means you may steal a photo… how wonderful for Daisy to have exposure in France!! Elle est célèbre!! Is that correct? Oh good! I wasn’t sure if I had that correct. I think French is difficult to learn. When FD and I have traveled to the French West Indies we always try to say a few words of French to passersby or boutique owners, just to be respectful, but I always have difficulty with anything more than “bonjour”, “salut” or “merci” without my little French dictionary! I do love the way it sounds – such a beautiful language. Haha, Lori, I never thought of you as a large mammal before now!! One of the things I love about reading blogs is they can give us access to a whole other part of life in this world… kind of like an opening in a fence!! Nice post and writing, as always Lori. Ha ha! Well Ardys, I AM a large mammal! Although I admit, I feel a bit like I’m doing the limbo dance trying to get under that bar! The good thing is, I’m not snagging my pants and ripping them anymore! Thank god you have at least one reasonable neighbor! I probably don’t comment on your magical posts as much as I should but I still love and cherish my time when I read and digest your stories about Daisy and her babies! I found this one especially smile inducing! Keep “em coming! Thank you so much Cindy! 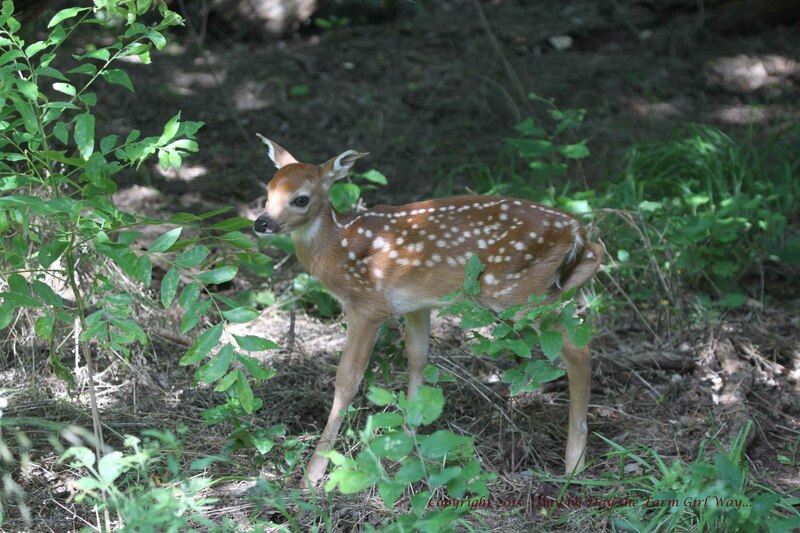 I have to fight off the mosquitoes, but I’m trying to capture photographs of these two fawns nearly every day. Daisy is being very secretive this year! 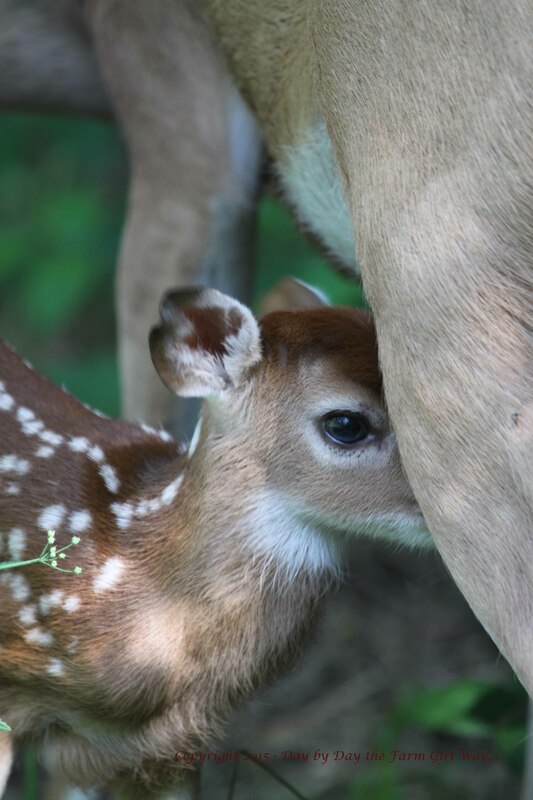 Lori, as always you capture the most lovely images of Daisy and her fawns. I am so grateful to read that you neighbor would allow you to open the fence like that! Wonderful for Daisy and her babies and so helpful for you to be able to duck through and not get snagged! Ha ha! At least he accepted your help, Lynda, and didn’t try to bite a finger or two off! Snappers are so ferocious, but highly interesting. Thank you for the lovely comment on Daisy and the babies. I really enjoy observing her bonding with her little ones. And, I noticed the first week, the little ones had already begun grooming Daisy! The mutual grooming begins very early! Robert Frost would probably agree, sometimes Torn Fences Make Good Neighbors! I couldn’t resist mentioning his memorable poem, Good Fences Make Good Neighbors… sometimes. Loved the pictures of your deer family! Daisy is a wonderful mother. Hi Judy and thank you for mentioning Robert Frost! He is one of my favorite poets of nature. Yes, Daisy is a very good mother, and I believe much of what she practices is simple instinct. It’s too bad humans don’t rely more on instinct in rearing children. Thanks for this post. I dislike fences too. What a great idea you and FD had to make a magic door. Maybe this story will inspire others to do the same thing! Thank you, Monica. That magic opening has really been popular with all sorts of critters. I like that we’re helping them move from place to place a bit easier! Just amazing photos, and what a great read with my coffee! Thanks so much! Adorable baby pictures. Fences can be such an issue. Being in cattle country, barb wire surrounds pastures. Those need to be kept up or animals can get tangled if wire is broken and loose on the ground (and cattle get loose). A walk through is such a nice idea. There’s a tall chain link fence on 2 sides of one of the nature preserves close by – with an opening for cars. It’s good the fence is there between the park and a 4 lane busy road. 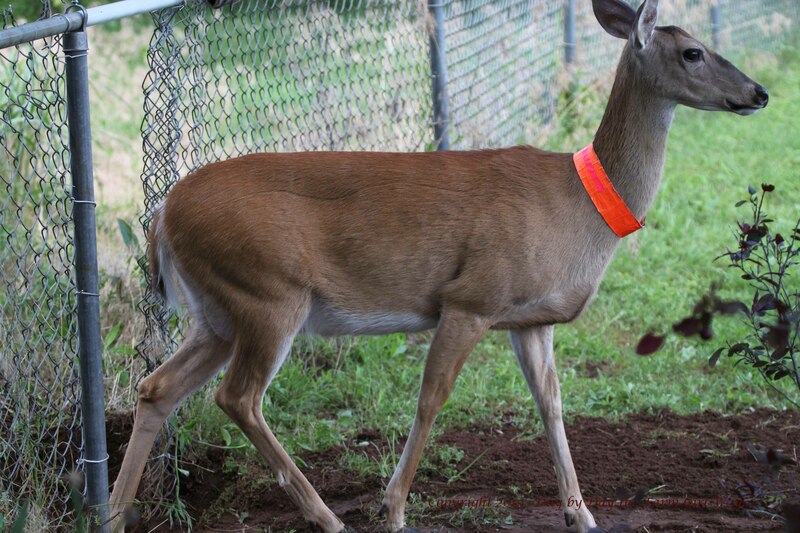 I think the doe have it figured out. 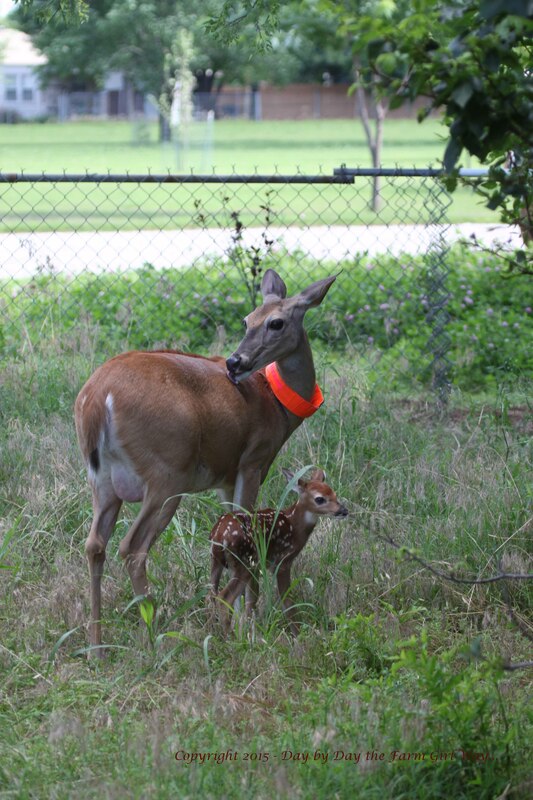 We often see them grazing in the lovely grass along the roadway – with the fawns safely behind the fence inside the park – calling mom and darting back and forth, but safe while mom eats. Then the doe wander back into the park through the driveway and collect the little ones before disappearing into the thicket. Surprisingly few deer venture across the road to the wild wetlands over there. So far so good. Go deer! We love our little deer herds. The community slammed a proposal to add another busy road against one of the other sides of that preserve. The same people that wanted to chop down the old oak….kept saying there would be 10 feet between the park and road and that would be fine/safe for deer. (ignoring the little waterway and wetlands that would be paved over). Stopped that one cold. Animals adapt, but people owe them some space and consideration. Oh, you might find this interesting, we got to the farm where we pick produce early enough to see and pet the big white Great Pyrenees dog that guards against cougars that roam here. His owner says the dog must be doing a good job as now there’s a huge number of rabbits around now. That dog is a real sweetie…and better than traps or poison. I couldn’t agree with you more about protecting wildlife and nature and fighting against community “progress”. And oddly, I have heard of local farmers out here using Great Pyrenees to protect livestock herds of all sorts from predators. These dogs are gentle giants. And like you, I wish more folks realized the trickle effect of poisons. We use “live” traps here if we have to move something, but we never do so except in winter when we’re pretty sure a female won’t have young somewhere. Every effort to control or remove wildlife takes great consideration of the long-term effects. Humans can be so thoughtless. Fabulous photos Lori. I’m glad you have a neighbor like Steve. Lori, I have to apologize. I have been so busy with one of my favorite cats for four weeks (she was put down July 2nd) and then I forgot about you. Most of the blogger’s posts that I follow go to spam and then I lose them if I don’t comment right away. Anyhow your posts are so compelling and written with so much thought that I often don’t know where to begin. I am amazed at the way you have written it all in such a orderly manner. Just as it all happened and with all these beautiful photographs to accompany your narrative. I think you and FD are the best keepers of any deer that has ever been saved by humans. Daisy’s choice of a birthing place is a testament to her trust and love for you. It really is a beautiful thing to read and to see those marvelous pictures. All your posts are like a text book for any person who cares about and loves wildlife. The opening in the fence was a wonderful idea and I bet many species will be cutting a trail through that gap. Daisy sure found that spot with ease. It surely shows how quickly she learns. Hello Yvonne, and thank you for so many compliments. I must give FD a lot of credit for editing my prose. He often organizes – I have the story in my head and write it out. It would be just fine as it is, but he edits and smooths and makes everything flow so lovely. The photographs are quickly taken when I can dash inside for the camera and they are never edited. Who needs to “perfect” nature? She’s beautiful just as she is. Even if I manage only blurry shots, or images that aren’t of great composition, it’s just what it is. I am sure editing photographs is a wonderful form of artistic creation for some folks, but for me nature is already perfection the moment I capture it. I am sorry to hear about the loss of your cat. Those situations are never easy, and it takes time to grieve and move on. I hope you find comfort in many beautiful and happy memories. I have had many dog companions in my life… those memories and old photographs are of happy times. They were all blessings in my life. I hope your memories have a healing quality. Lori, thank you for your words of comfort regarding the loss of my cat. Memories, as you say give one comfort and time eases the sadness. Every writer needs a husband like FD who willingly helps out with your posts. I understand now how going forward with your book would be difficult. After reading “Empty Nest” it was very clear that your spirit is with other things. But one day you’ll begin again. My only thought is that you could begin condensing some of the past posts and at least that seems to be good beginning again- at least that’s my whack-a-doodle idea. I’m having trouble moving forward on the story of my son’s Border Collie I just can’t seem to make up my mind on how I want the next part to go. But then I don’t have your writing skills. I think that some people are “naturals” at some things and I’m not. Take care and find comfort in knowing that your followers and blogging friends are sympathetic to all your and FD’s efforts to be wonderful stewards of your ten acres and all the creatures that visit and find refuge there. Thank you so much, Yvonne. Gosh, this summer FD has had to pitch in with more than editing blog posts. I have not been able to do as much of the outdoor work as I would like to (which I’ll explain in coming posts), so I manage what I can and let him handle the mowing and garden harvest most evenings. It is a wonderful relationship we have – helping each other and allowing each other to do what WE need to do for ourselves. I have written some on the book but I change direction all of the time. I also feel an urgency to keep after it because the memories are not sharp and clear like there were a couple of years ago. Thankfully I have old blog posts, thousands of photographs with dates to help remind me, and a journal that I kept to keep track of Daisy’s progress when she was little. The photographs are the most helpful. And, as I happen to remember special times or incidents I jot down those thoughts. I think mostly, the writing will be the easy part. I tend to get overwhelmed by the process after that, which I know nothing about. I know nothing about publishing. I read about it and then get overwhelmed. FD always says to worry about writing the book first and then we’ll tackle publishing. He’s right. Ha ha. Thank you for your kind words and encouragement, Yvonne. It means so much. Lori, you husband is a jewel and you each compliment the other. I’m glad that you are working on the book but he is right about the publishing part. Just get it down on paper/in computer and be sure to download all your posts to an external hard drive and your photographs as well. Your internal hard drive could crash and it would be REALLY hard to get that all retrieved. But most likely you are already down loading to an external drive. I hope you are feeling ok and if not do take care of yourself and get plenty of rest. One of my next posts will explain just why I’m taking some time off this summer! 😉 And yes, we do an online backup. Ever since our old external hard drive crashed and I did temporarily lose my photos, we make sure to do a regular backup!